We now come to what is the first historical, or perhaps semi-historical dynasty, known as the Keianian. Today there is a family of chiefs in Sistan who claim descent from this illustrious stock, although... it seems more likely that they are descended from the Saffar Dynasty. In India some of the Parsi families make the same claim, which is generally conceded. 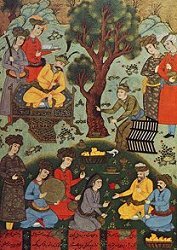 The first monarch of this dynasty was Kei Kobad [Kei Qobád], a lineal descendant of Manuchehr, whose retreat was the Alborz range, and who was brought from his place of retirement by Rustam. The great champion now took the field against the hereditary foe for the first time and covered himself with glory by defeating Afrasiab in single combat, from which, however, the Turanian monarch escaped alive because the girdle by which he was held gave way. Thereafter peace was concluded on equal terms, and it was agreed that the Oxus should remain the boundary of Iran, as before. Kei Kaus, who succeeded his father, invaded Mazandaran against the advice of his councillors, and was there defeated in a great battle by the Div-i-Sufid [Div-e Sefid] or "White Div"... During the battle the army was struck with blindness, and it is reasonable to see in this legend a reference to the eclipse which occurred during the battle between Cyaxares and the Lydians.... This being so, we may to some extent identify Kei Kobad with Deiokes and Kei Kaus with Cyaxares. But it would be a mistake to press the matter too far, and there is no resemblance in the name. The next incident in the drama is that of Siawush, heir to Kei Kaus, who deserted his father's court... He took refuge with Afrasiab, who at first received him as an honoured guest. A few years later, however, false charges were brought against the young prince, and he was executed; but his infant son Kei Khusru was hidden and ultimately restored to Persia, where he succeeded to the throne. 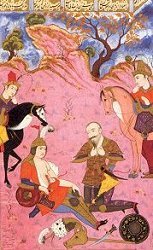 "Rustam beside the dying Sohráb"
Lohrasp, who succeeded Kei Khusru, after ruling for some years, resigned the throne to Gushtasp, who was Zoroaster's royal convert and patron. Again wars with Turan followed, and again Persian forces suffered great reverses, in the course of which Lohrasp, the old king, and Zoroaster were killed at Balkh. On this occasion Isfandiar, whom his father Gushtasp had imprisoned, came to the rescue and recovered not only the lost provinces of Persia but also the famous national standard. Isfandiar had been promised the throne by Gushtasp, who falsely proclaimed his intention of following the example of Lohrasp. When he claimed it, he was persuaded by his crafty sire to accept the mission of bringing Rustam, who was alleged to have thrown off his allegiance, to the foot of the throne in bonds. Again heroic combats ensued, and again the Champion of Persia slew his adversary winning threby his last great fight. A few years later he fell into a pit prepared by his treacherous brother and there ended his heroic life.